I hope everyone has had a great Halloween! Ours wasn’t super- it’s been pouring rain and storming all night. But we tried to have fun here at home! Tonight wraps up Halloween inspired manis 😦 I have a couple to show you tonight! 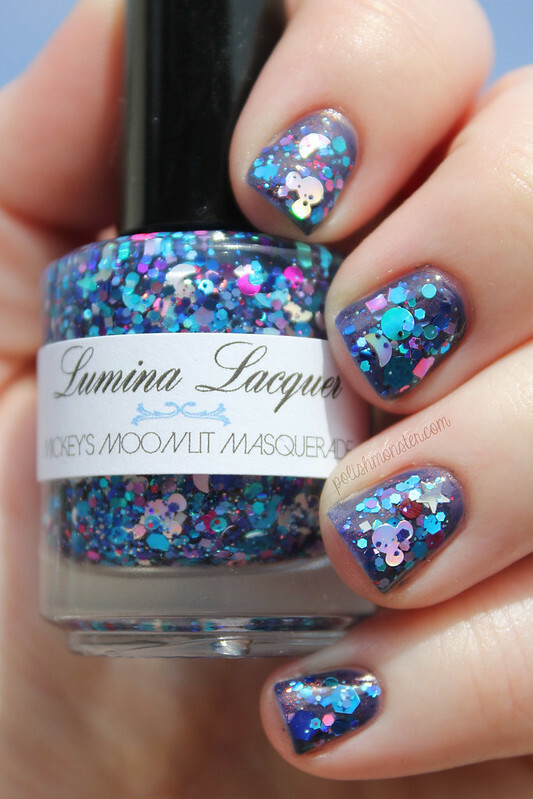 First up is Lumina Lacquer’s Mickey’s Moonlit Masquerade over Takko Lacquer Kiss the Sky (post coming in a week or so)! 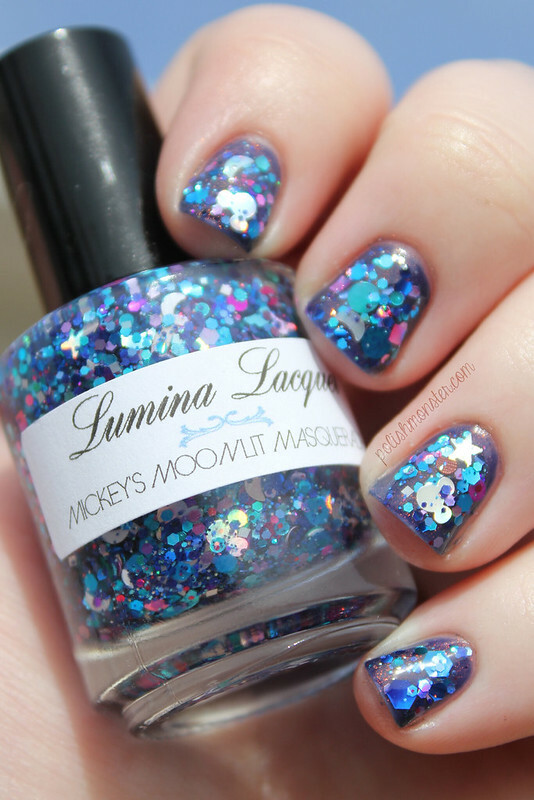 I really love this Micky polish- and it looks so lovely over Kiss the Sky! As with most of my Luminas, I applied using the dabbing method. I didn’t have to fish for any glitters- such a fun variety! Next up is the pumpkin mani I kept talking about! Like I said- simple, but festive and fun! I never got a chance to take ‘real’ photos of this one before there was so much chipping I couldn’t save it. But I was able to enjoy it for almost a full week! I got a bunch of compliments! The base color is Sinful Colors Citrine. I picked it up last summer from the Wow! Pop! display, but I’ve heard that it’s part of *this years* Halloween display! So if you want to grab it- hurry! My phone picture is showing this as more red than it actually is- it is a red orange, but a bit more orange leaning. For the jack o lantern face, I used Nail Thins- SUPER easy to apply, just like a sticker- but it’s incredibly thin, so you can’t see a ridge where it’s applied. I’ll provide links at the end of the post! 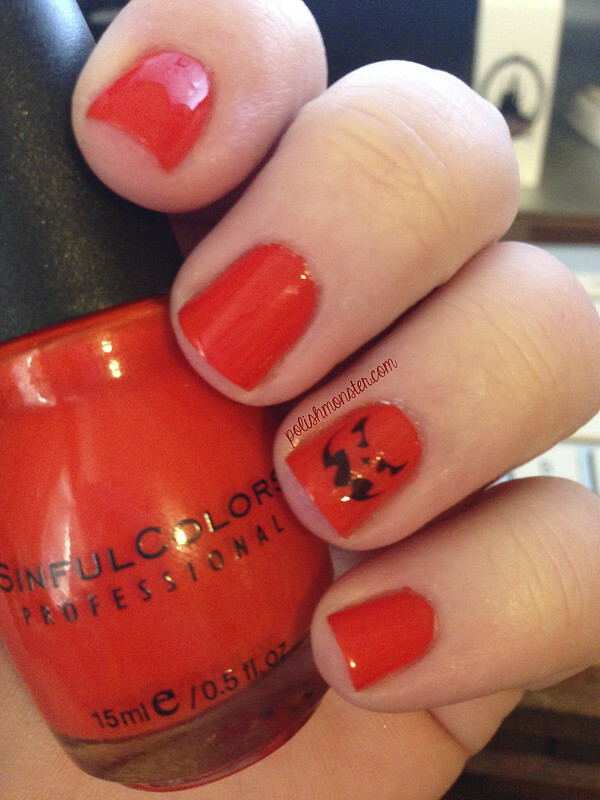 Last but not least, is my official Halloween mani for this year! 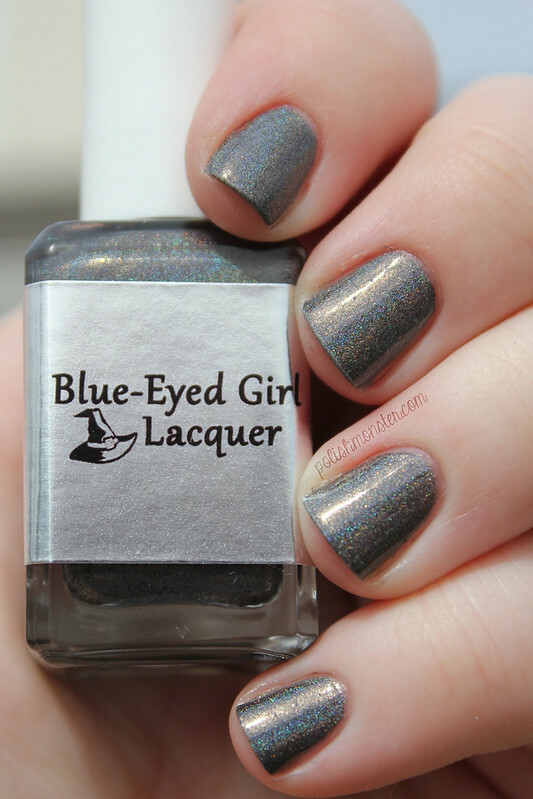 The first halloween mani of the day features Blue Eyed Girl Lacquer and Lumina Lacquer! First up is Discontinued Limited Edition- which is a Limited Edition! This polish is part of Julie’s Nail Polish Frights Halloween collection. It’s a beautiful charcoal holographic polish filled with orange sparks and shimmer. A perfect Halloween polish! Application was wonderful- photos show 2 coats with no topcoat. 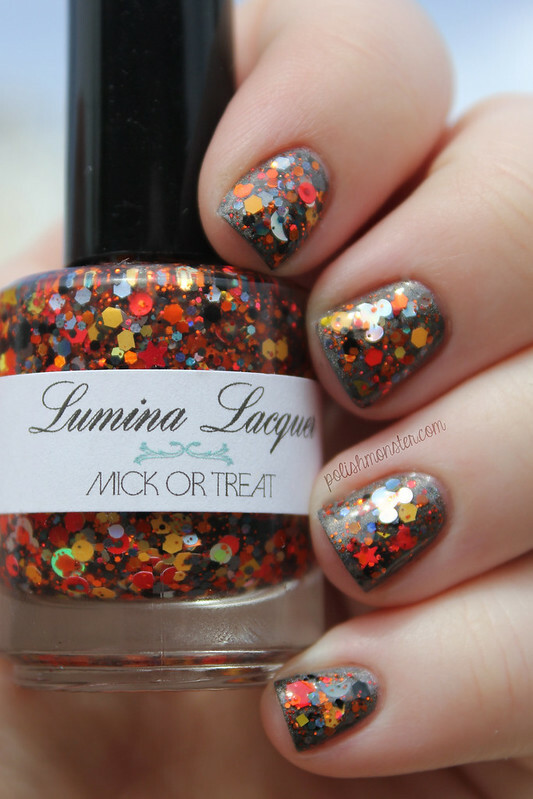 Then, I topped Discontinued Limited Edition with Lumina Lacquer’s Mick or Treat! 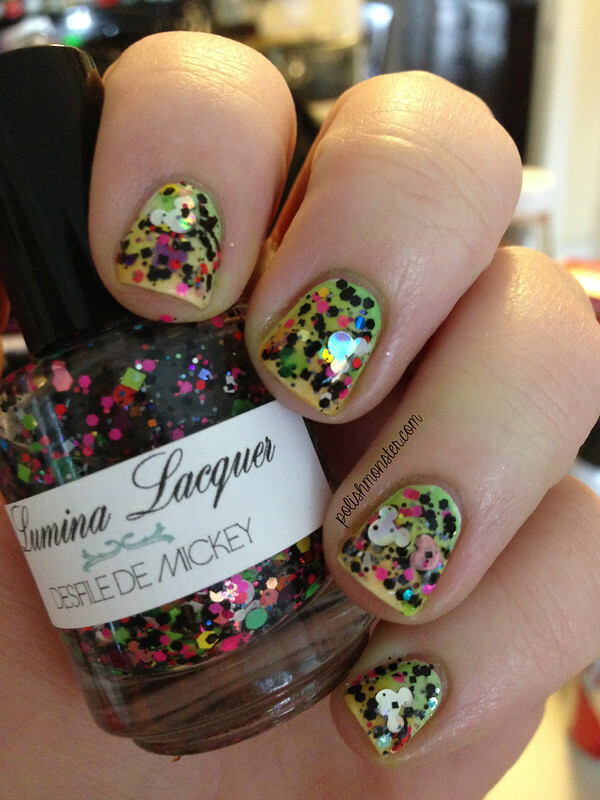 Mick or Treat is a fun glitter bomb that features holographic Mickey Mouse heads, as well as lots of red, orange, yellow, black and holographic glitters. Photos show 1 coat of Mick or Treat- I applied by dabbing. I was able to get 1 Mickey head out naturally, the others I did fish a little bit for- but Lumina Lacquer glitter bombs are so dense you rarely have to fish for long! Both of these polish are Limited Edition- while Mick or Treat is sold out (you can check sales groups and blog sales though! ), there are still a few bottles left of Discontinued Limited Edition if you hurry! Quick post this morning to make up for forgetting last night- I should have today’s normal post up this evening! 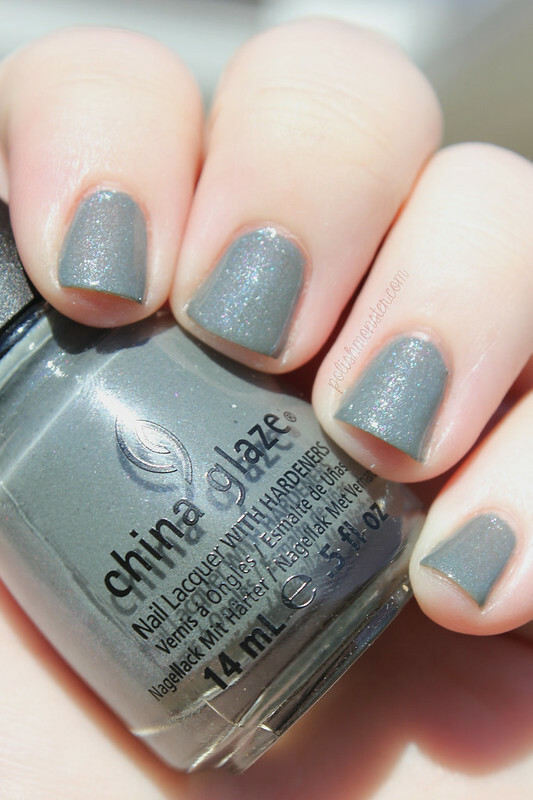 China Glaze Immmortal is from last year’s Halloween 2012 Wicked Collection. Though no longer available in stores, you can still nab this one on blog sales and sometimes some online stores. 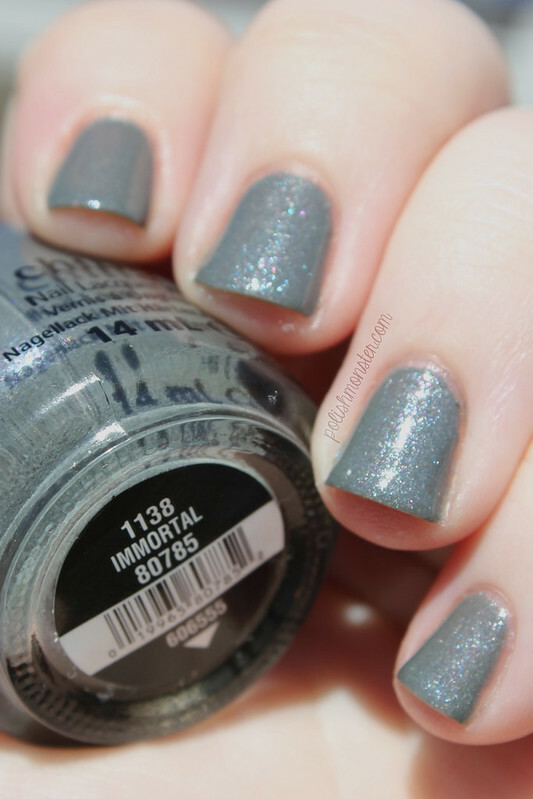 Immortal is a really pretty concrete grey polish filled with blue and pink shimmer. I love grey polishes- don’t ask me why, it’s a very random favorite since I don’t otherwise enjoy grey- so last year I knew I had to grab this one! My only issue with this polish was it’s application- which wasn’t terrible, I used 3 coats for coverage- but it’s opaque enough that it should have been 2 coats. But even though I let the first coat dry a reasonable amount, I still had random bald patches after the second. Tonight I’m going to be showing off a new favorite- 365 Days of Color’s After All This Time?. For Halloween this year, Sunny released The Horcrux collection- an amazing set of 7 polishes inspired by the horcruxes of the Harry Potter series. 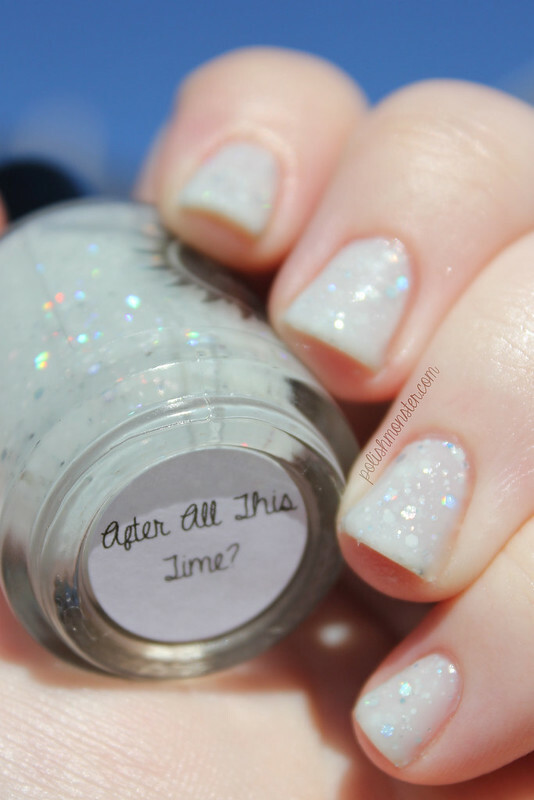 To tie in with the Harry Potter theme, the October polish of the month is After All This Time?, a *gorgeous* polish in honor of Snape’s love for Lily Potter. *sniffle* I don’t know many fans that don’t get seriously emotional over this scene in the book/movie. After All This Time? is a light grey crelly base filled with holographic silver glitters. It is reminiscent of a pantronus- which is featured in the scene. Application was good- I needed 3 coats for opacity, and it was still a bit see through in some spots. I think the sheerness works well for the polish’s inspiration though! After All This Time? also glows in the dark!!! It has a beautiful blue glow, just like a patronus. The glow is very sensitive- I went outside for photos, and next picture is what the polish looked like without a flash *in my hallway* in the middle of the day. Darkness is not needed for this baby to shine bright! After All This Time? is sold out at the moment, but I know it will return! 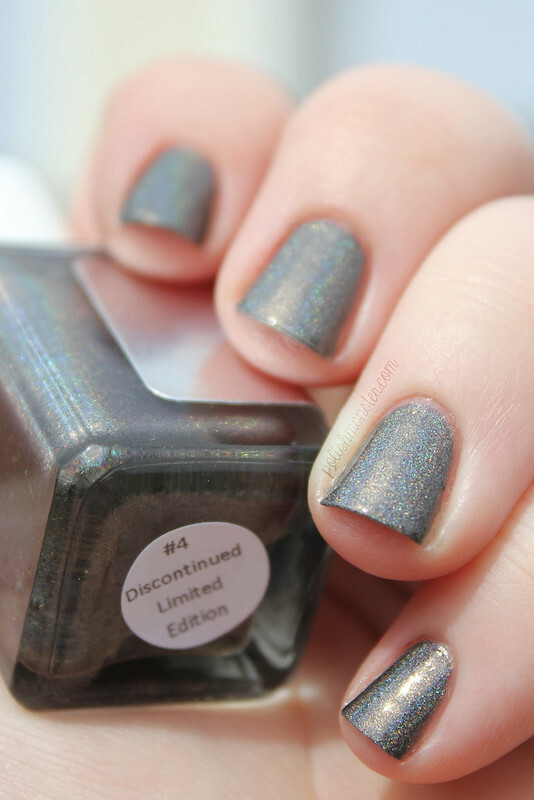 Be sure to check it and the other Horcrux collection polishes at the 365 Days of Color store! This is honestly my favorite book/movie moment of all time- I LOVE that so many amazing indie polish makers are letting it inspire such gorgeous creations! What are some of your favorite book/movie moments that you’d love to see in a nail polish? I paired up China Glaze Riveting and Enchanted Polish To Die For for a fun halloween-esque mani. I decided to show Riveting by itself first! 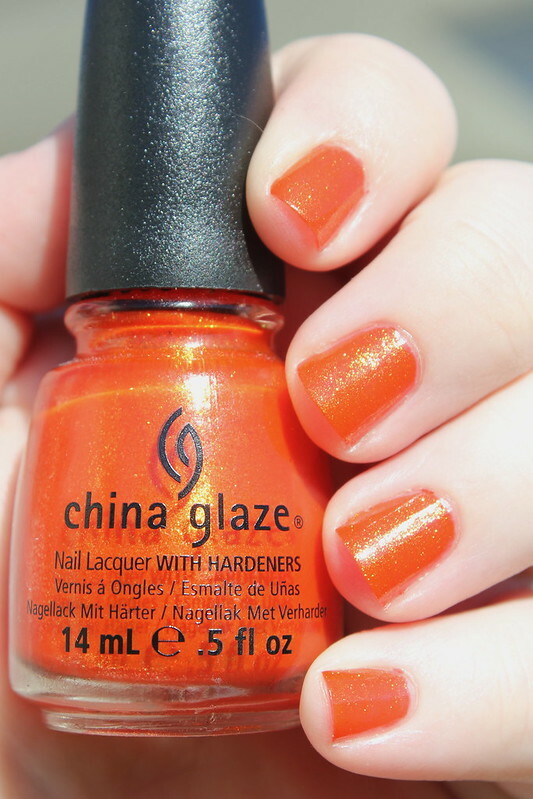 China Glaze Riveting is a gorgeous shimmery orange color. This was one of the Hunger Games collection polishes released last year- and one of the first I picked up! It’s incredibly stunning. Photos show 2 coats, no topcoat. 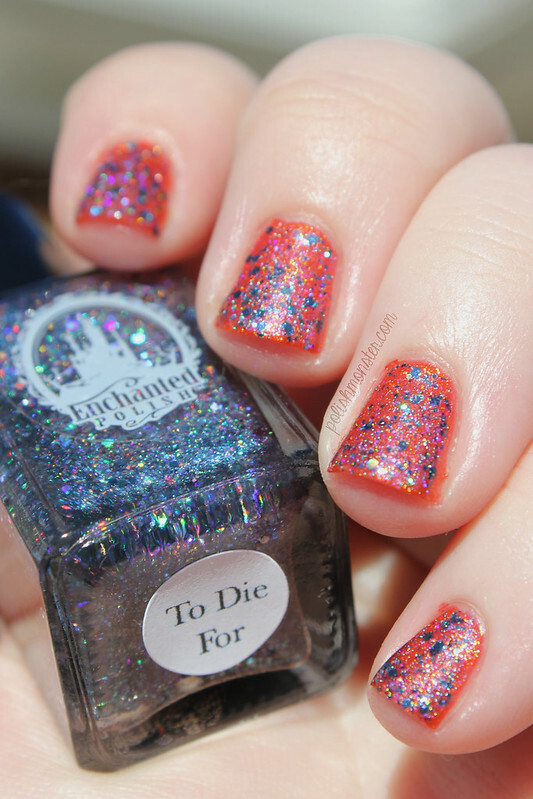 To Die For is a fun glitter topper filled with a very slightly charcoal tinted base filled with charcoal holographic glitters. Application was great- this is just 1 coat with no topcoat, and everything went on super smoothly and evenly. 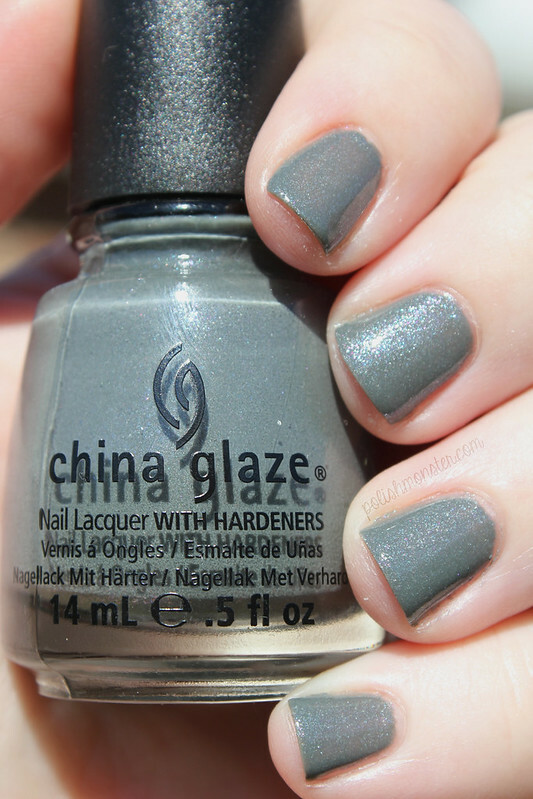 China Glaze Riveting is no longer available in stores- it was released in Feburary/March of 2012 for the release of the first Hunger Games movie- though you can sometimes still find it online and via blog sales! 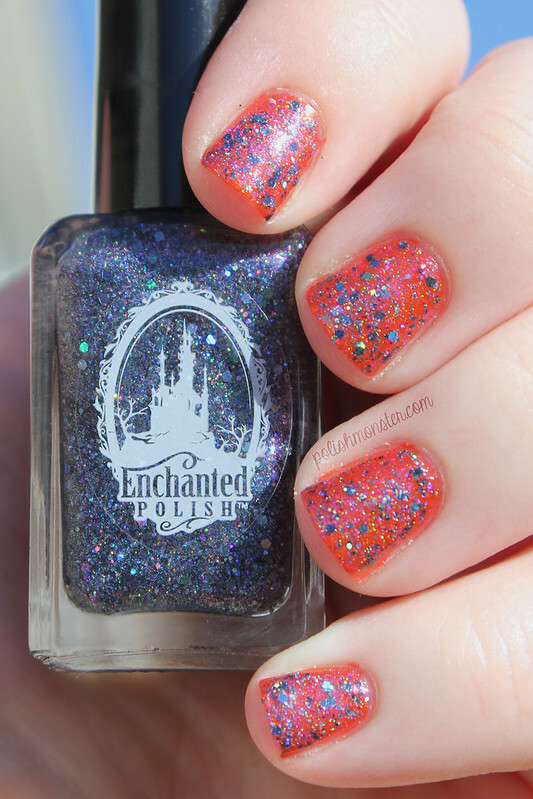 Enchanted Polish To Die For is a Halloween Polish from Enchanted Polish. I can honestly say I have no idea if this will return this year- though it never hurts to keep checking! As I mentioned on Facebook- tonight kicks off my week of Halloween manis! Every night through Halloween, I’ll be posting a Halloween mani- sometimes just a Halloween polish- indie and mainstream- maybe even a little bit of nail art! I thought to start things off, I would- for the first time- show off my own creations here on my blog. I’m sure a lot of you have seen my frankens (Monster Polish) crop up here and there- Dulcie at Ohthreeohfour.com has posted about a few, Jen at Jen’s Nail Files has taken a bunch of pictures, and a few other ladies have posted on IG and my Facebook wall. I’ve given them away in friends giveaways, I’ve sold or swapped a few here and there- but for the most part I don’t really sell, and I’ve never shown off photos myself. Obviously that changes tonight! I’ve long said I wouldn’t sell my polishes, and that it’s just a hobby- which is still true. But after a year and a half of this hobby, I have a lot of extras! So I’m going to start selling extra polishes through Big Cartel in the next few weeks. I won’t be carrying a permanent line, and most polishes will only have a few bottles available. If there is a very very strong demand for a particular color, I can try to make more- but when I make things I rarely write down the recipe. So if you’ve ever wanted a Monster Polish, keep your eyes peeled for my little store! This Monster duo are the polishes I created for the Halloween Giveaway that just ended on Monday- so one of you may still be able to get your hands on them! Right now I don’t have any extras available for sale (don’t kill me! ), though I could probably create more if there’s a strong interest. First is Purple People Eater! Purple People Eater is a light purple holographic polish with a faint blue flash. I used 3 coats for these photos- the polish is sheer, but builds well. The holographic effect isn’t super strong, but is definitely noticeable even indoors. I layered 1 coat of Monster Mash over Purple People Eater. Monster Mash is a glitter bomb chock full of most of the shades and finishes of purple, black, lime and orange glitters I had! I did a bit of dabbing for placement, but this glitter polish is thick enough that it’s not totally necessary. I’ll update information about when and how to buy Monster Polish as soon as I am able. Check back tomorrow for my Pumpkin Patch mani- it’s super simple, but fun! Halloween is my FAVORITE holiday- so when my friend Tish at Cosmetish asked me to join up with her for a spooky giveaway, I jumped on board! Together with Lac Attack, we’re bringing you the Enter if You Dare! Giveaway 🙂 Here’s what you can win! Prize #1, from me: 2 Monster Polishes (eee! My new labels! )- Monster Mash (a glitter bomb), and Purple People Eater (a purple holographic polish)- perfect alone, or paired together! I’ll try and post some photos of these soon- along with the polishes from my Blogiversary giveaway. 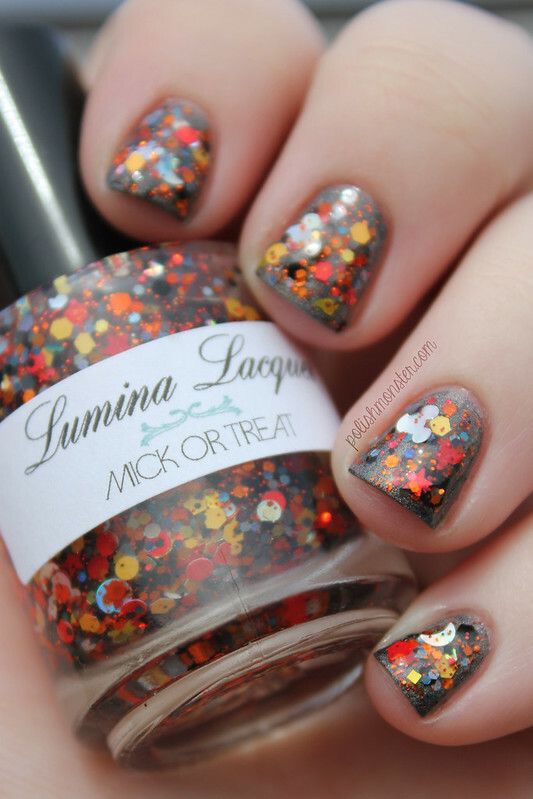 Prize #2, from Lac Attack: her entire Tricks &Treats Halloween collection! This giveaway is open to everyone, and you can enter by following the Rafflecopter link below! There are a TON of optional entries, so be sure to check them out! This giveaway is running now through October 21st!